Now that some 4 weeks passed by since I´ve had my fist real offshore sailing experience with a Class 40 sailing yacht and with having gained some distance to that trip I am trying to sum up my experiences and bundle testimonies of my fellow crew mates to have a thorough review of what it is like to sail a Pogo 40. You may read the cruise report of the first leg here and of the second leg under Gennaker here . First of all: Looking at the boat is an experience by itself. Being accustomed to the view onto classic yachts, seeing this compact, flat hull with its extra-wide stern is amazing. This hull seemingly promises to go fast by its looks alone. My heartbeat went faster upon arrival at the mooring and it was the same with the other crew members. Let´s board the ship and have a look around. 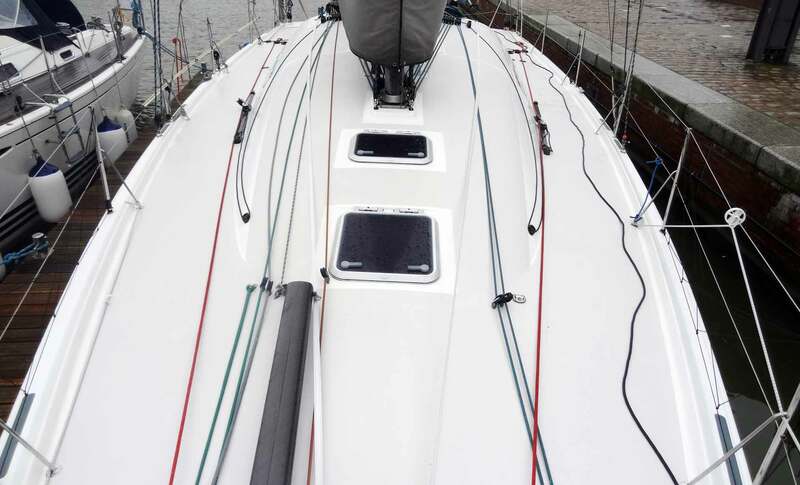 A Class 40 is made for single handed and double handing racing. That means first of all that all ropes and lines must be guided in a way that they could be worked upon from the cockpit. 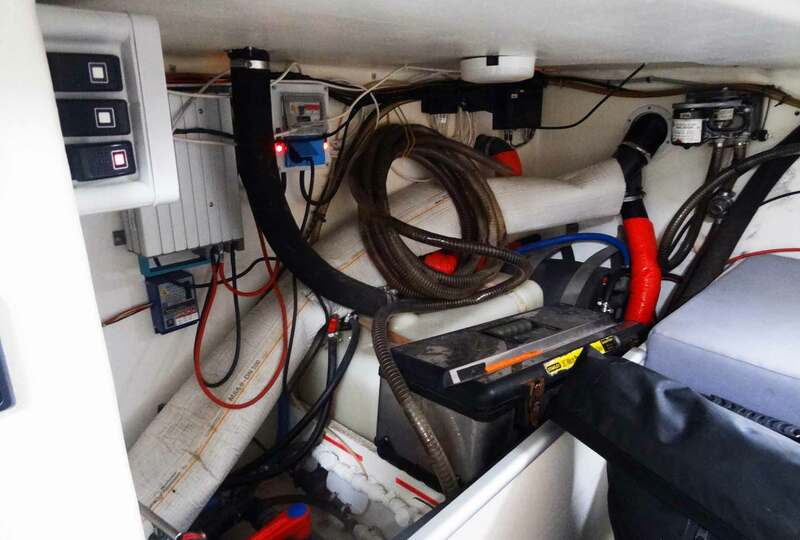 Which is done beautifully in the Pogo 40: All halyards run down within the massive carbon mast or over the cabin roof and through jammers and can thus easily be unlocked, brought on to the winch and worked with. Only for hoisting and reefing of the mainsail somebody has to proceed midship to the mast. Every single rope can be worked upon from the cockpit. 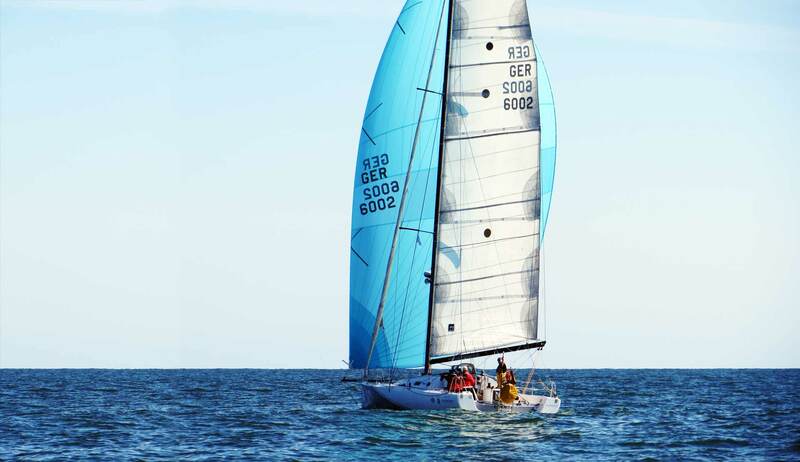 When sailing single or double handed – above all in race situations – maneuvers have to be carried out with speed. To assure this, everything has to be within reach of one person: And it is indeed! 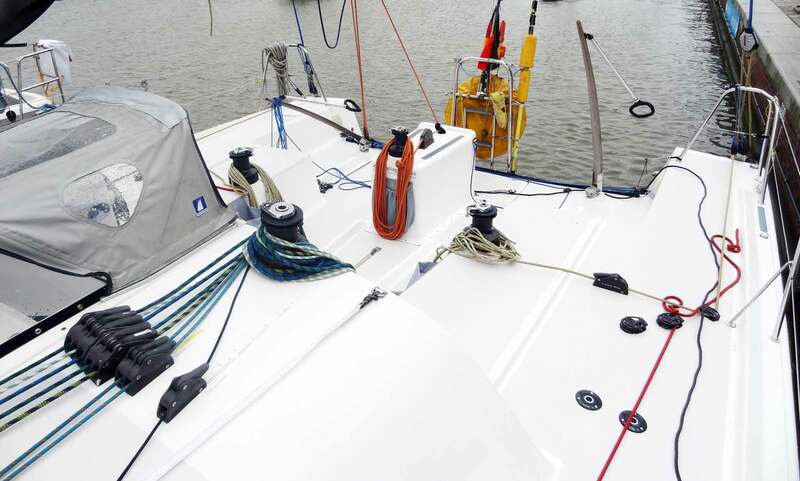 There is a sheet winch on either side of the cockpit, well within reach with the one mainsheet winch on the center-housing for the life raft. This winch can operate both sheets of jib and Genoa as well as the backstays which also run through spinlocks. The cockpit: Everything´s still within reach and optimized for single hand sailing. 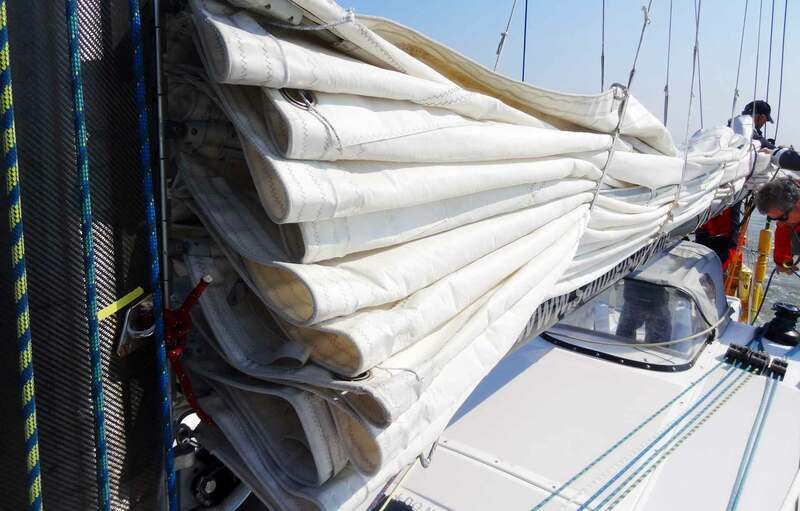 Traveller sheets end in spinlocks right vis-à-vis the mainsheet winch. So, in theory a lone sailor could handle all the running rigging alone. Which of course is proven by a dozen of single hand sailors on Class 40 yachts all over the oceans. Although the cockpit is with its 4.50 meters extremely wide, ways from winch to winch and to the tiller helms are very short. The timeframe from changing conditions to a reaction can thus be made very short. Lazy Jacks are a must. Of course, our Pogo 40 was equipped with Lazy Jacks to have the ritual of taking down the main sail made as easy as possible, though I can state by my own experience that both hoisting these 70 square meters of canvas and taking them down properly was extremely hard work: I can barely imagine doing this all alone. Thank god electric winches are invented. I felt at home in our Pogo´s cockpit and after a few hours manning the different stations was a no brainer. Again: Being responsible for the whole ship alone should be trained very thoroughly. A Class 40 is far away from being a no frills boat control wise. That was something I was looking forward to the most when booking a cruise on this boat. 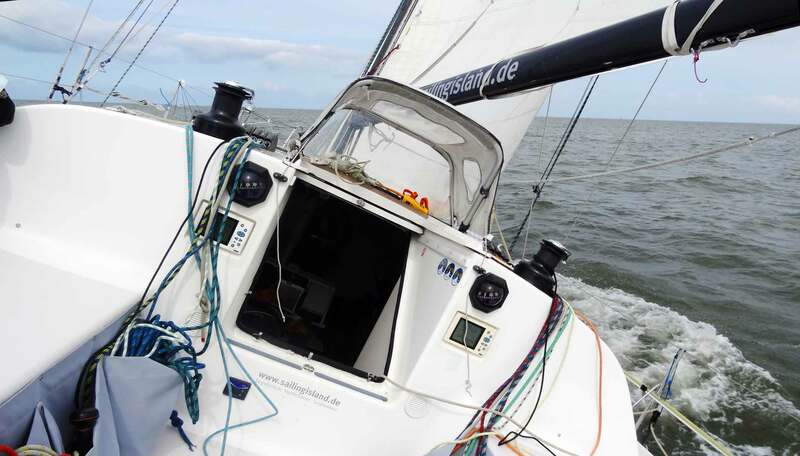 After having done the interview with Sven, co-owner of SY KNUBBEL, a Pogo 12.50 (which can be read here) I was impatiently waiting for that sensation when the hull does overcome the boundaries of the wave system and sails faster than her theoretical maximum hull speed. So, all hands on deck, hoist all sails-ho! And tell me now what´s this planing like? This is what planing looks like. “Planing is when this constant gurgling and bubbling at the stern suddenly stops and is substituted by a smooth Swoosh….-like sound”, tells Sven when I was asking him. Sitting at the helm of POGO 1 beating upwind with 11 to 12 knots I am shouting to the skipper: “Capt´n, at which speed will she start planing?” “We already are – it needs 8 knots”. And yes, looking aft in our wake I notice a white trail indicating the gliding of our hull. It´s just an awesome feeling! Maintaining control over the ship´s bearing is easy: The Pogo 40 is equipped with twin rudders in such an arrangement that even when heeled extremely the lee-rudder will have full steering capabilities. There was never too much pressure on the rudders though we didn´t have had to cope with too severe gales or swell conditions. It felt quite easy to trim her course by giving rudder – she reacts very vivid and instantly to even smallest corrections. Steering whilst planing? No difference to the classic way of sailing. Heeling is a matter of stability here. Speaking of heeling: The Pogo 40 needs heeling. This process assures the exposure of a smallest possible wetted surface under water thus reducing resistance. She sails very stable even when heeled extremely to up to 40 degrees and I never had the impression of being unsafe. Roaming about on deck when heeled is tricky: It´s wet and slippery, there are ropes virtually everywhere and – when sailing with a crew of five – even a 4.50 meters wide cockpit can easily become cramped. Under full canvas with Gennaker downwind. A truly unique experience was sailing under Gennaker (which can be read in detail here). 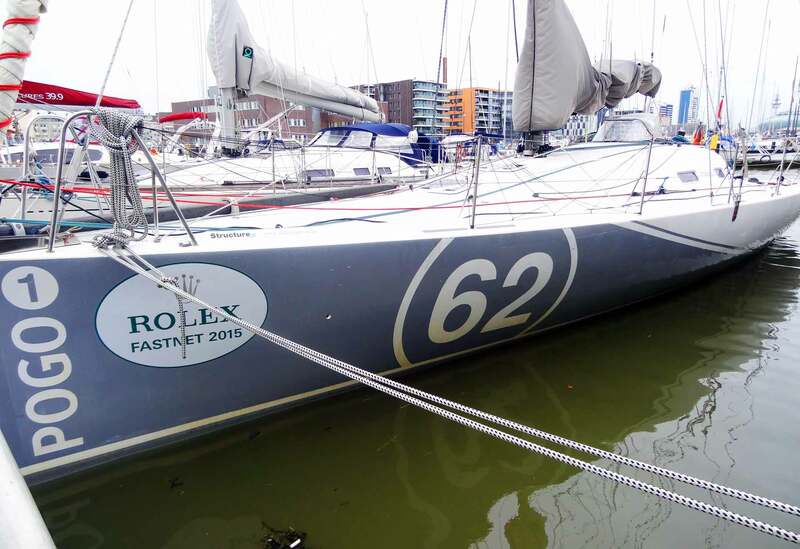 The Class 40 is trimmed to go downwind – and she will go as fast as hell! Fastest speed on our POGO 1 in light conditions has been 14 knots, our skipper told us of occasionally exceeding speeds of 20 knots easily. Again: This is a racing machine and riding this stallion must be done only by experienced skippers and crews. She´s definitely not a boat for the rookie. 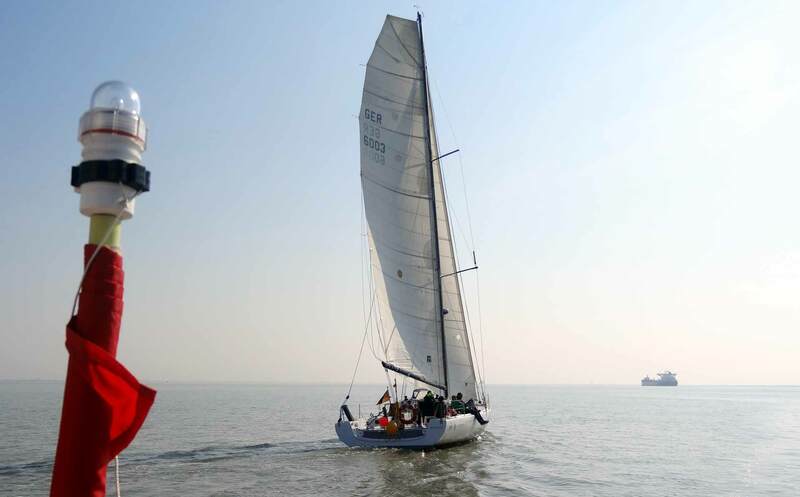 Nevertheless, counting myself to the rookie side and looking at how my fellow crew mates managed their jobs on board – all of them with far more experience in sailing than me – with a good skipper sailing on a Class 40 is both exciting, full of adventure and thrilling on the one hand and filled with beauty and grace on the other. Seeing the Class 40 under all canvas, accelerating to full speed and starting to plane filles me with pure joy. 40 ft. are huge – but can also make a smaller impression when sailed by a large crew. It is barely imaginable that any sailing vessel can sail faster than these kind of boats. I was puzzled when we were overtaking another sailing yacht going at full speed with engine in a matter of minutes, doing our 50 miles in less than 6 hours with light winds. 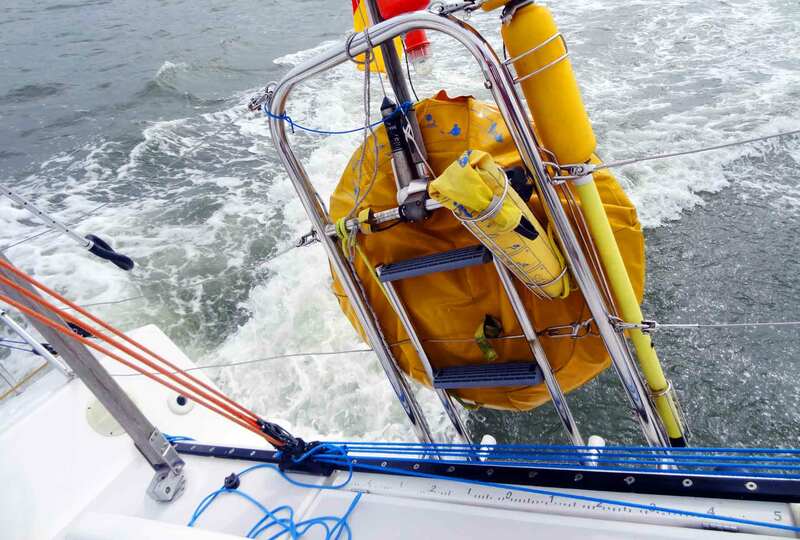 Although it´s a frightening idea but I´d love to be sailing with a Pogo 40 when things get a bit rougher. Well … there are some cruises offered on the Pogo 40 in September. This do get rough in September … This yacht let endorphins flow to the liters, people do have a constant grin on their faces for it is extremely satisfying to sail on a Class 40. Going fast is satisfying: Who wouldn´t trade his VW Golf for a Porsche? I felt constrained to compare the beauty of these boats to the grace of the old square rigged Clipper ships, which might be a sacrilege, but thinking of it there are so much similarities to these fastest sailing vessels of forgotten times. “She sails wet.”, said skipper Thomas when conducting the safety briefing. 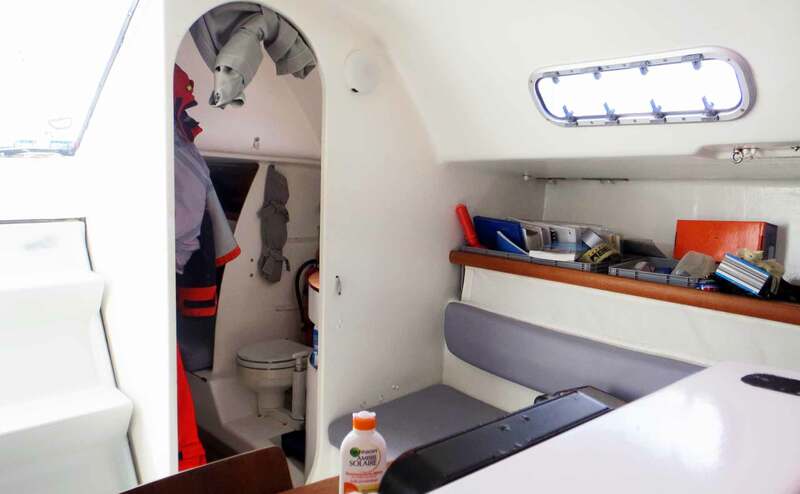 There was some water coming down the companionway indeed, but I read reviews of real tough regattas and saw pictures of saloons full of water, soaked cushion and no dry place left whatsoever. As well a frightening prospect, but hell, this must be an awesome experience! Down below a Class 40 like the Pogo 40 is a true miracle regarding space. She is a 40 ft. boat – I personally find 40 feet with more than 12.50 meters huge compared to my 33 ft. King´s Cruiser – but due to her extreme width of 4.50 meters internal space is just huge! 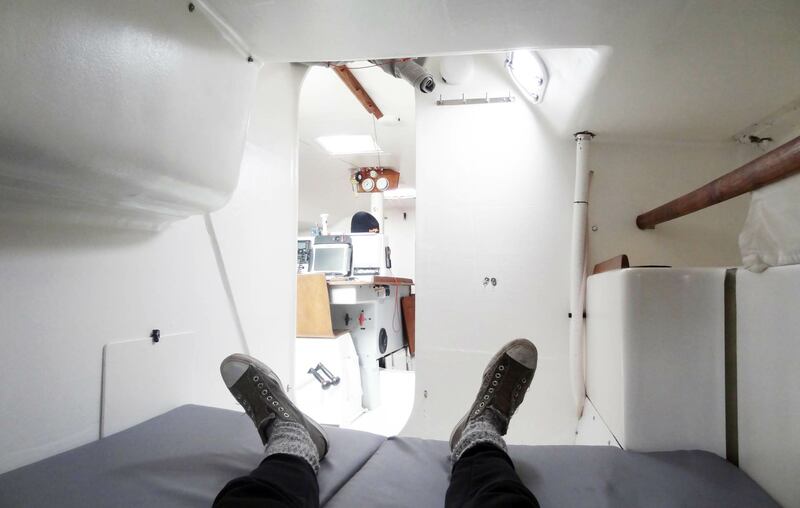 Even with 5 adults leaving their berths, brushing teeth, searching for clothes and having a cup of coffee the saloon didn´t felt cramped at all. The main saloon is dominated by the large navigation station right on the keel in the middle of the cabin. 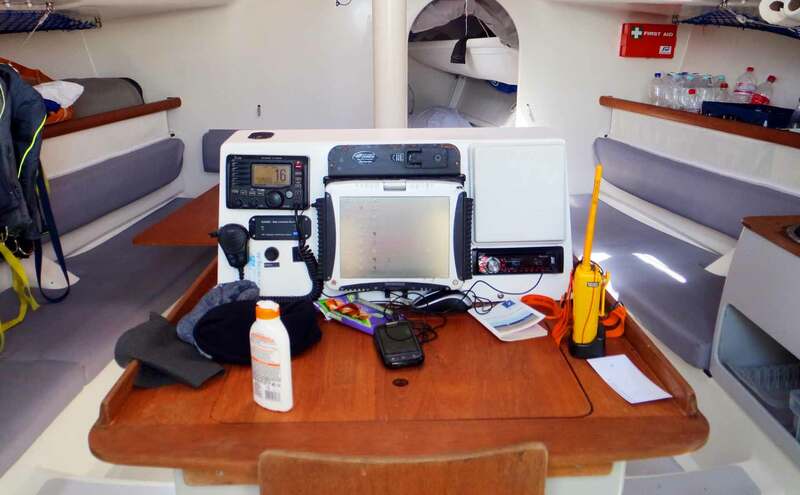 A seat, a rugged laptop, radio and plotter – even by poking one´s head down the companionway all essential data could be grabbed at once. Down the cabin in the middle is a big fridge and the large folding table which makes dining even with a big crew easy. Massive construction for maximum rigidity. Due to the fact that this is a high performance yacht you shouldn´t expect panels or veneers: Even the massive structural stringers of the underbody structure is clearly visible. Watch your step! 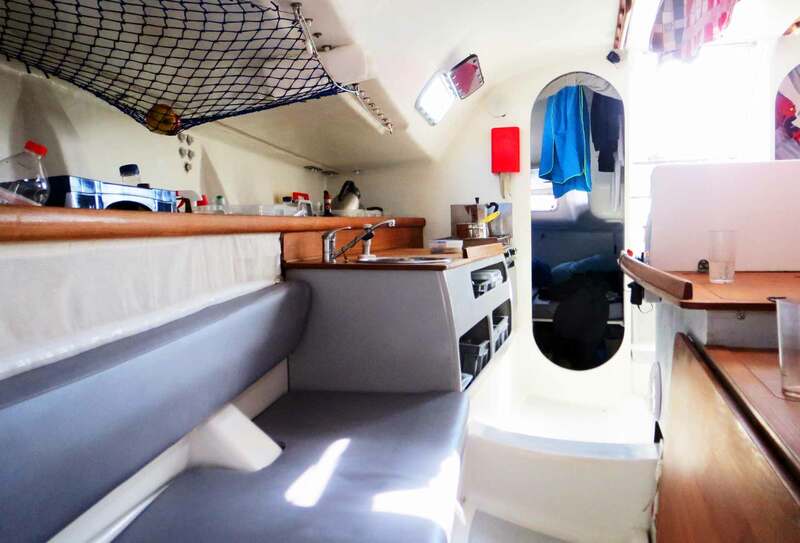 There´s an L-settee to the port side, a long settee on the starboard side right after the galley which features a two-fire stove, a large sink and working table. The galley on the starboard side. Head and port side aft cabin. 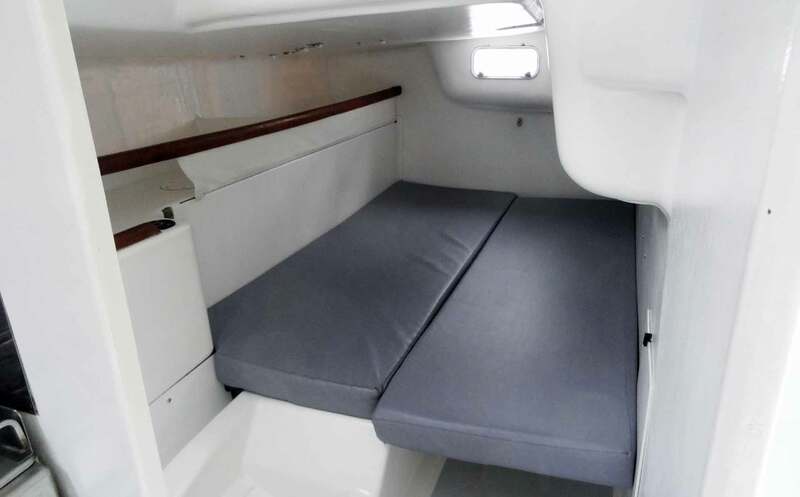 Next to these three possible berths there is more on the port side settees, two persons, another one on the starboard side and – whilst in port – the fore cabin could offer two additional berths. In the end, a crew of 8 persons could find a place to rest while on board but again, that´s just in theory. Port side aft cabin is cramped with auxillary machinery and stuff. When we have been underway with five people – four crew and one skipper – we´ve had two of us in the forepeak, me and another member in the aft cabin, skipper and the last crew member in the saloon berths. Though I didn´t slept on any of the other bunks, I guess I have been lucky indeed having won a berth in the comfortable aft cabin. Can you imagine cruising in a Class 40? To sum it up: The interior won´t appeal to everyone since the isn´t any. Wooden surfaces are limited to galley and folding table, cushion is water proof and so not very cozy (the color being grey does add nothing to create a “ship-like” atmosphere as well) and there is bare GRP everywhere you look. She´s a pure racer. Oh, is she? 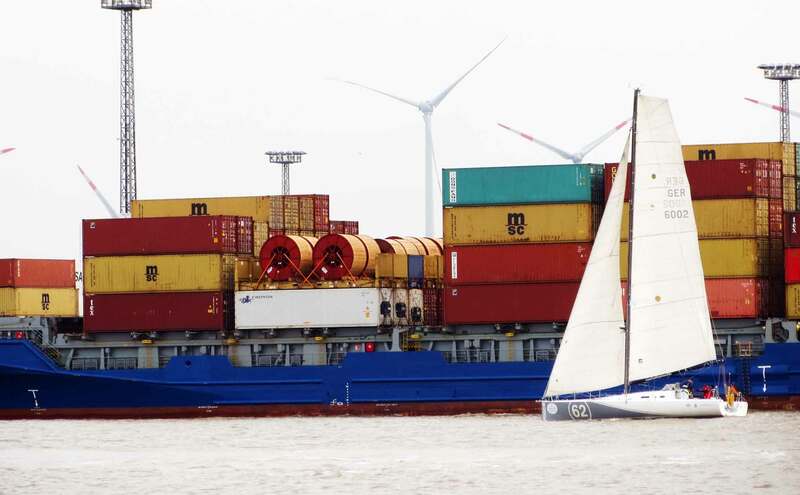 Cruising with a Class 40? There are more owner cruising with their boats than serious racers. You can do cruising with these boats: They have everything needed. This ship is large enough to have provisions and fuel for Blue Water passages, more than enough space and – above all – it will bring you faster to the destinations of your dreams or – being fast above all – allows to stay longer because of reduced sailing time. I guess, a Pogo-concept of fast sailing does correlate with a French sailing philosophy (which I tried to look into here by interviewing Charly Fernbach of Pogo structures and naval designer-legend Marc Lombard). At anchor in Barbados? Why not? If one can adapt to this bare and uncomplicated style of sailing by actively abstaining from luxury I would say yeah, cruising with a Class 40 can be done and should be done! Why wasting precious time on lame old fashioned cruisers? Why not prowl the oceans with speed, arrive early and spend more time? 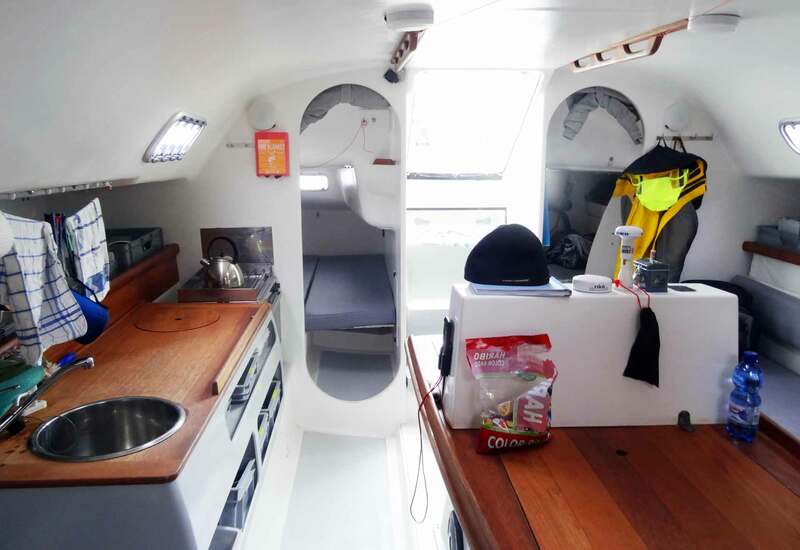 Well, I guess it´s because these days a classy wooden Hallberg-Rassy interior has its fans still – and besides, controlling a yacht like the Pogo 40, going wet and fast with extreme heeling is prospect of asking too much of the ordinary family skipper. 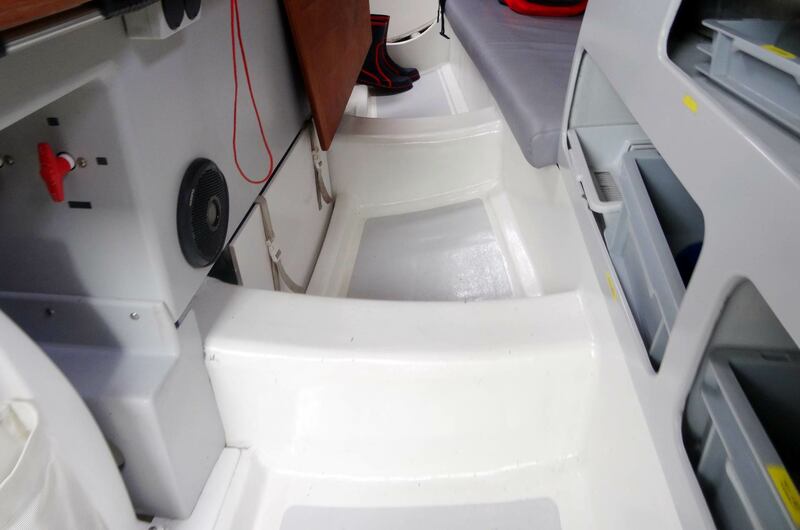 Looking at the sparse interior fitting – even when thinking of replacing the faux water proof leather of the cushion by a friendlier, fresher color, it´s still hard to envision myself and my family going on a long cruise (even a short one) in this boat. Well, envisioning myself I can, but the family … Nevertheless, there are reports of some families doing exactly this. And the more I think about it – given that I can build up more and more competence and sailing abilities over time – this idea becomes attractive and tempting to dream of ever more. I just love this no-frills-approach to sailing (apart from the not-so-no-frills demand of the boat to be controlled with aplomb), this clean, white, bare surfaces. No wooden panels to care about, easy to maintain and clean, no doors, no portholes – no frills. And with all these no frills-commodities, there comes so much joy, so much adventure, so much fun. So much demanding in this boat and – which is most attractive I would say – so much gain in reachable distance! Going faster than 10 knots at virtually any time increases the range of activities extremely: Going faster could mean to reach more distant places or reach more places in the same time. Fascinating. And, sadly enough, unreachable for me (and totally impractical as well). 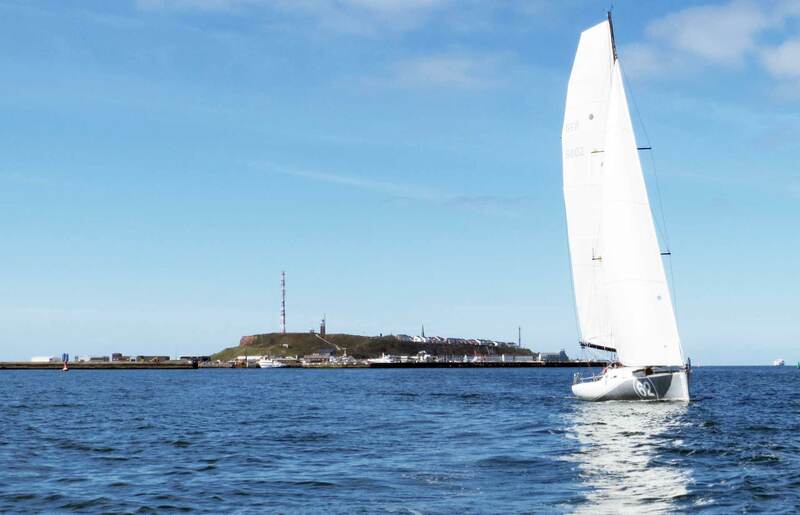 But there´s a solution: Simply by booking another cruise on these fantastic sailing machines. The HAS to be a next time. This kind of sailing is too tempting. 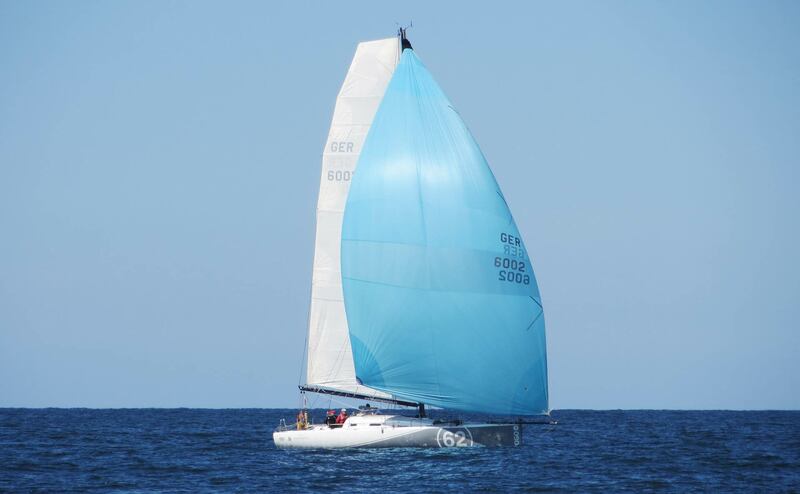 An alternative for owners who seriously consider to get a Class 40 could be the smaller yet comparable Class 9.50 racer of which some interesting boats are on the market, or – very interesting indeed – a Beneteau Figaro II. A sailing yacht legend of which I am going to publish a couple or articles in the near future. Bottom line: Class 40 sailing has opened my eyes and thinking back to the wonderful 110 miles aboard POGO 1 still thrills me. Very interesting article. A lot of information that can be usefull to introduce the concept around Class 40. I would like to try ( or to charter) one for one week. Id it possible? thanks for commenting. Since this is just a magazine and I am no charter agency, I cannot help you in trying out a Class 40 sailing yacht. 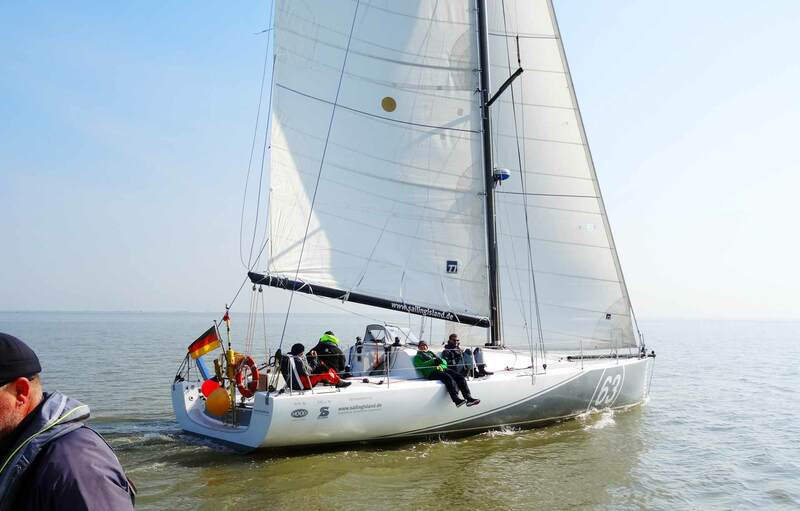 There is a German charter-firm called http://www.sailing-island.de where you can buy a berth on trips with a Pogo 40 Class 40, maybe this would suit you?